Race 3: And that's a wrap on the Abu Dhabi schedule! This Race 3 actor has always kept us updated with the film's schedule in Abu Dhabi. That's how we know that Salman Khan and team have wrapped the shooting of the movie in Abu Dhabi. 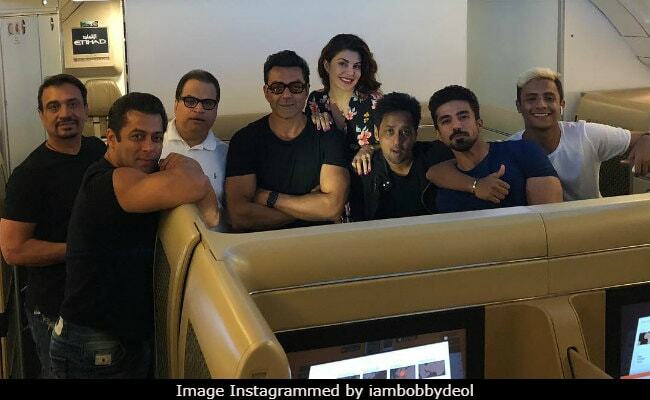 On Tuesday night, Bobby Deol Instagrammed a group photo with the main man Salman Khan, Jacqueline Fernandez, Saqib Saleem and producer Ramesh Taurani from when the team were on their way back to India and wrote: "On our way back after a great shoot schedule of #Race3 in Abu Dhabi ... Thank you for the love Abu Dhabi." Bobby Deol plays the role of Yash in the film while Jacqueline features as Jessica. Saqib can be seen as the feisty Suraj while Salman, who has replaced Saif Ali Khan in Race 3, portrays the role of Sikander. And that's a wrap on the Abu Dhabi schedule! It appears that Anil Kapoor, who returns to the third part as Shamsher, left Abu Dhabi a few days before the rest of the team. This is what he tweeted on Monday: "And it's a wrap! Abu Dhabi you have been great! Cheers to the whole team of Race 3! It's been a pleasure working with you all!" Meanwhile, Bobby Deol has been diligent with his Race 3 duties, offering sneak peek from the sets of the movie in many of his Instagram posts. For example this one, in which one can also spot Sonakshi Sinha with the Race 3 team. Then there was this time when he was "Racing on, in Bangkok" with Salman Khan and Daisy Shah, who also stars in Race 3. Filmmaker duo Abbas-Mustan will not return to direct Race 3, which has made way for a new director - Remo D'Souza. Race 3 is scheduled to hit screens on Eid this year.